In the one-column display, the column title can be shown. The title will be taken from the title of the view page. This will result in a multi-column display as soon as a higher value than 1 is entered. The view page will then be repeated from left to right. The padding will be expanded vertically and horizontally by the value entered here in pixels. 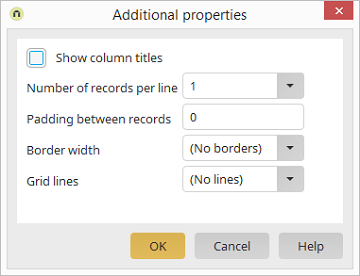 If a border around the table is desired, a border width can be defined here.